I am sitting at the breakfast table. It is 10 a.m. My second cup of tea is cold, and I am still working my way through the day’s New York Times. There are few things that make me happier than drinking tea in my sunny kitchen while moving through the Times without interruption. But instead of feeling unconditionally happy, I’m having twinges of guilt. A small voice inside is murmuring: What kind of sloth is still in her robe at ten on a weekday, having accomplished nothing more than witnessing from afar the world’s crazinesses? Lazy me, I don’t even do the crossword puzzle. I have had many mornings like this since I retired, delicious mornings in which I was not at the gym at six, not dressed in heels and ready to walk out the door at 7:00, not on my email or telephone, not making the world a better place before noon. And I have spoiled many of those mornings by intruding guilt tapes in the background: “Lieberman, you are being so lazy. Where is your productivity, you sloth? Get up and DO something. For years, my puritan work ethic, even without a drop of puritan blood, served me well. The ways I assessed opportunity, measured success, and evaluated my behaviors were useful, productive and rewarding for five decades. Now I have left that phase of my work life and moved into a different kind of life, but you can see that I forgot to retire my old self assessments as well. It took me a long time to understand something very simple. If I want a new kind of life – and I do – then I need to give up judging my actions with that old school ruler – because where it leads me is to the same life I decided to leave behind. It is trite to say change is hard….but trite can be true. So: Change Is Hard! Going from a highly structured, ordered life to something else, not yet well defined, is jolting. 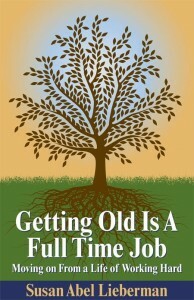 There is ample advice in the aging literature that says work as long as you can to stay young and vital. By all means, keep working as you have been if the work is satisfying and you can do it and you want to do it. But after decades of hard work, we may want a change, even if it scares us. In some instances, the work is killing our souls. In other instances, it is killing our bodies. Sometimes, it is a one-two punch. Other times, we don’t give up on the work but the work gives up on us, and we are forced to stop or at least re-group before we are ready. What did working cost me; what have I had to give up for working? Was being a good friend pushed to the side? Was it often difficult to be as authentic as we wished to be? Did we ignore taking care of our body? Was there enough time for play and rumination? How much did we explore new, unrelated arenas? There is, of course, benefit and a cost in every action. What were the costs of our work life? Everyone doesn’t give up the same things. We know people who have successful careers and taken on new sports, new hobbies, new passions while continuing to work hard and well. I wasn’t one of those people. During my full-time working years, I seldom managed to limit myself to forty hours. Nobody made me do this. I kept wanting to make the program better, bigger, deeper, and so I kept focusing on how to do this. When I came home after long days, we would have dinner and then I would go upstairs to my desk and start my other job, managing the enterprise called Lieberman. I didn’t mind the trade for a long time. I didn’t even notice for most of those years. I just did what I did and liked it. And when I stopped, my heavens, it was strange. I wasn’t sure who I was and what I was supposed to do. I had no strategic plan. Without a new sense of me, I kept wanting the old sense of me to reappear and reassure me I was still me. I hadn’t yet decided that there could be a different sort of me – still me but wearing new kinds of clothes, so to speak. I didn’t miss all those meetings that started late, without an agenda, and ended with no one writing anything down or committing to a decision. I didn’t miss all the times I pretended to understand what people were saying when it sounded to me like nonsense. I didn’t miss the times I had to be polite, even a little pandering, to important people I thought lacked manners and good sense. I did miss the times I felt important and useful. I missed the moments when I said or did something others found helpful. I missed being paid to go learn stuff. I missed feeling what I was doing mattered. I missed opportunities to meet new and interesting people regularly and in situations where they actually wanted to know me. I’ve come to see that many of those people who wanted to know me only wanted to know me in my heels, not my sneakers. I’ve also come to see that my smart words all too often made not an iota of difference; my utility was not imagined but time-limited, and I didn’t need an employer for learning or do work that matters to me. the challenge is to figure out new criteria to use in judging success. Finally, we get the best job of our lives. We can take a vacation whenever we want, set the hours, determine the working conditions and establish priorities that satisfy us intellectually and emotionally. We can look for rewards that are important to us, not to others. However, as I discovered, it is challenging to give up old habits for new ones. I can offer a very personal example to illustrate the point. I have been working on this book for over a year. I love working on books. Writing helps me think through issues of interest …my own kind of therapy. In trying to write clearly and honestly, I have to dig into both facts and feelings, and I get wiser, clearer and more knowledgeable. I would rather do this than cook or garden, sew, exercise or just about anything else others do for fun. But with the book publishing business focused more and more on recognizable names, I slipped into fretting about getting this book published and promoted. Do I learn from the work? Am I working on my own schedule? Do I feel I’m growing from the work? Does the work provide opportunities for good interactions? Don’t misconstrue: Of course, I am hoping hard someone will buy and publish my book and if they do, I’ll be there worrying about marketing it. It would fantastic if the book were talked about and widely read. But when I apply what I have been thinking about this stage of my life, if none of it happened, this project would not be a failure. Rather, it has already been a great success – and that’s not an answer I would have tumbled to last decade. I went from fretting to having a surprising sense of enormous gratitude. It has become so clear that how I measured the success of my days in my forties and fifties is not how I want to measure them now. The challenge is to figure how I want to evaluate the choices for spending time and effort. That hard work-full-bore-don’t quit strategy was great for me when it was great…but that time is not now. It no longer fits. I don’t think retirement means we stop working if work means doing something that engages our efforts and energies and leads to accomplishments. Instead, we work at different things, for different reasons and with different rewards. Now, we get to work on becoming our very best selves. Maybe we should have been doing that all along, but making a living, raising children, buying groceries, meeting deadlines and being generally busy and, sometimes, feeling a little bit proud of just how adept at juggling all that busyness we were, filled our waking hours. What if…just as an idea to play with for a minute…being less productive is a measure of success in this stage, having more time for contemplation, tenderness and reflection is a measure of success? What if learning to resist the flashy charms of Mistress Busy is a sign of growth and maturity?